Get ready, get set, save! 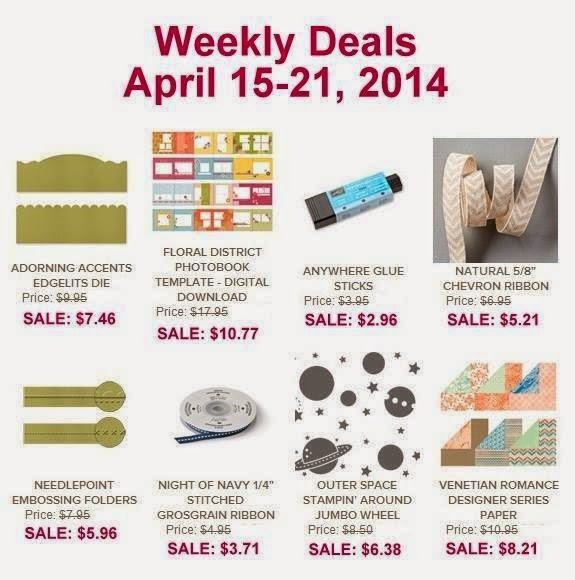 Stampin' Up is offering FREE shipping on orders placed Monday, April 21 (after 2 am.Eastern) through Friday, April 25. All orders placed during this week will not be charged shipping or handling fees, only tax, making it a fabulous time to have some goodies sent straight to your doorstep! Expedited shipping is excluded from the free shipping offer. Stock up! There is NO MINIMUM ORDER for the FREE Shipping offer! 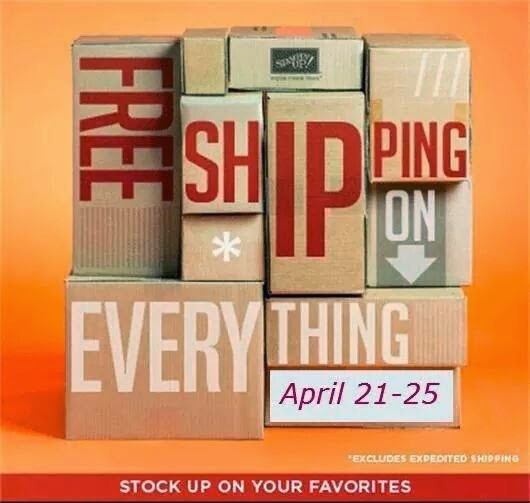 Shop for as much or as little (or as often as you want during the promotion) because shipping is FREE! Perfect timing! Stampin’ Up! 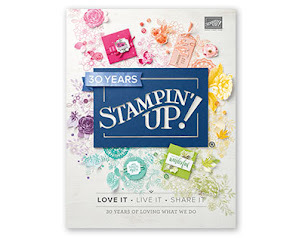 will release the retiring stamp and accessories list on Monday, April 21, the same day FREE shipping begins. The list will be posted on my online store. Please note: The retiring products (both stamps and accessories) are only available while supplies last, so order your favorites ASAP. 2012-2014 In-Colors are retiring: Gumball Green, Summer Starfruit, Midnight Muse, Raspberry Ripple and Primrose Petals. If you need ink-refills for these ink pads order them NOW – they will sell out fast; Raspberry Ripple ink refill sold out on Friday, days before the FREE shipping promotion. Place your order NOW. Weekly deals are eligible for FREE shipping; you can order the current deals before they expire at midnight then order the new deals announced on Tuesday, pay no shipping on either order. Order personalized stamps (or other crafty gifts) for your friends and ship them directly to their home--no extra cost! It's easy-peasy lemon-squeezy gift giving! Free shipping includes print products from My Digital Studio (MDS). While you're thinking about your order, make sure you put any retiring stamp sets, colors, or accessories at the very top of your wish list, because ALL retiring items are "first come, first served" this year. When they are gone, they're gone! Raspberry Ripple ink refill is already sold out. The Retirement List will come out Monday, April 21st. Since shipping is free, I encourage you to place your orders online via my online store so your isn't delayed (or sold out) but I'm always happy to place the order for you. Spinner card class, these funs cards will delight everyone! Tuesday April 29th 7-9pm. Tuition is $10 or free with a minimum order. Register now! Masking Tape Technique card class, Tuesday May 13th, 7-9pm. Tuition is $10 or free with a minimum order. Father's Day (or masculine birthday cards) Friday May 23rd 7-9pm. Tuition is $10 or free with a minimum order. A few spots left contact me today to reserve yours! Say a fond Farewell to Retiring SU products on Tuesday May 27th, 7-9pm. Tuition is $10 or free with a minimum order. RSVP today! 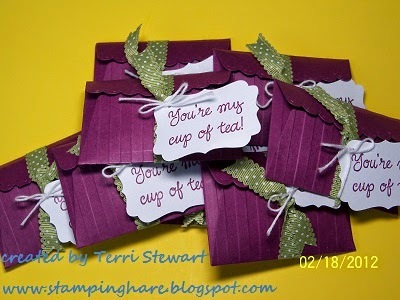 Stamping is fun and FREE shipping is a fabulous treat--enjoy it! I had a fabulous tea with my tea buddies (we call ourselves the Tea Bees) a few days after Christmas. Of course being out to tea with my wonderful TB friends is always a treat! 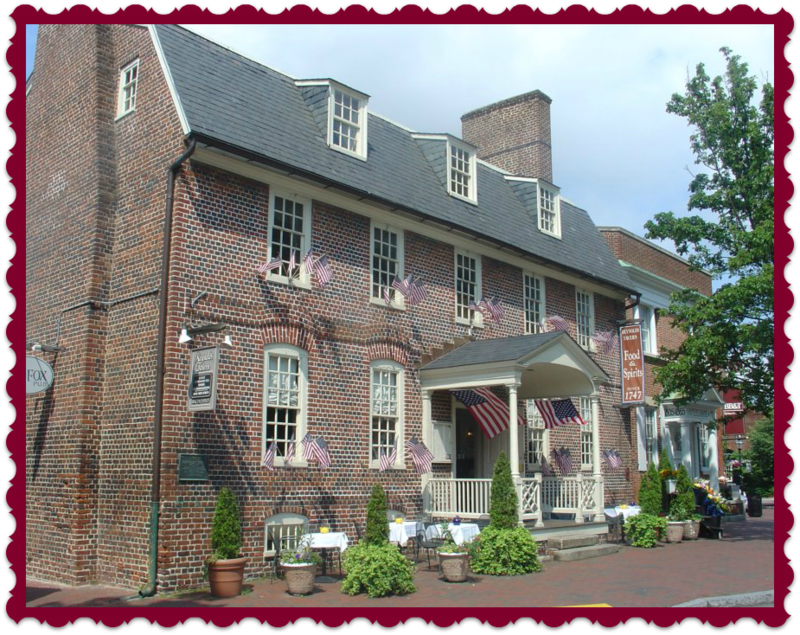 Being in historic Annapolis at the beautiful Reynold's Tavern made it all the more special! Their hats looked so good but I look goofy! And she gave me a belated birthday gift...sugar cube tongs and very cool tissues! Love them! We had adult beverages first. I tried a raspberry something or other--it was good! Tea with your tea buddies is always a fun treat!